How do I change the default view displayed in the Submission Details screen? 1. 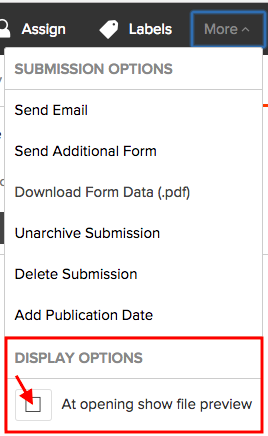 In the Submission Details page, click the More menu at the top right-hand side of the screen. 2. Under the More drop down, check the At opening show file preview checkbox if you want your default view to be the File view. Uncheck this checkbox if you want your default view to be the Summary view. 3. Once you have made your selection, your preferred view will show by default whenever you click into a submission's Details page.